The largest federal law enforcement agency inside the Department of Homeland Security is going Glock, according to a recently released award. Since 2004, CBP has issued Heckler & Koch P-2000 pistols in .40 S&W. In not only a change of manufacturer but a caliber change as well, the new Glocks will be chambered in 9mm. Prior to fielding the HK, Customs issued the Beretta 96 in .40 S&W, which replaced legacy six-shot .357 revolvers in 1995. “This contract provides CBP law enforcement personnel the latest in handgun technology and represents our commitment to providing the highest quality use-of-force tools and equipment to our law enforcement personnel who defend America’s frontline every day,” said Deputy Commissioner Robert E. Perez in a statement. The award, solicited last year, was issued after independent performance testing by the National Institute of Justice laboratories, along with “extensive field evaluations,” and direct input from CBP personnel. With more than 45,000 sworn law enforcement agents and officers, CBP’s mission includes security through the U.S. Border Patrol as well as customs and counter-smuggling operations at over 330 ports of entry. It is expected that the transition to Glocks will be accomplished by 2021. 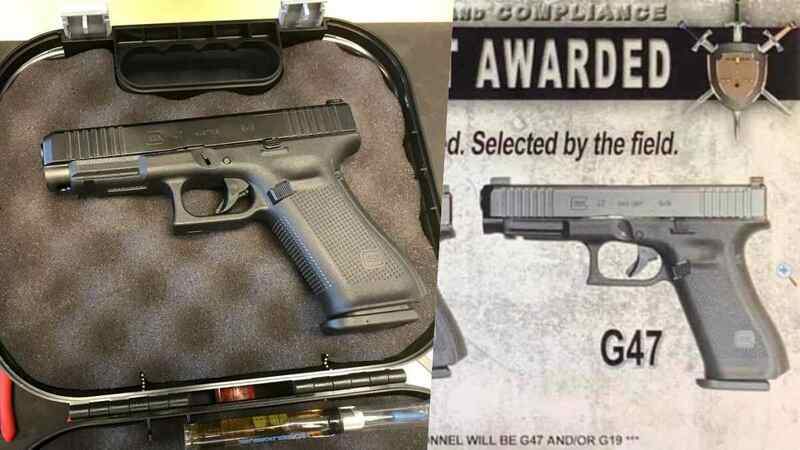 While this week’s press release does not detail which model Glocks are covered in the award, gun forums and industry press have speculated that CBP’s choice could be a mixture of legacy G26 and G19 designs, as well as a new Glock 47, with the latter of the two being optics-ready, a feature specified in last year’s solicitation. Images purporting to be from a CBP officer of the new G47 design surfaced early Tuesday.